Well, well, well. Today is a very special day, indeed! Today is my friend, Lisa’s, surprise virtual baby shower!!!!! A bunch of us got together and all made little treats for the virtual party, an idea which made me completely fall in love with the blogging community all over again. I’ve known Lisa for about a year now and I can say without a doubt that she is one of the sweetest people that I know. A while back, when her and her husband still lived in California, I met up with Lisa for lunch in San Francisco and we ended up chatting for hours. I was so excited to make a new local friend but then…whomp whomp….they moved to Oregon. We roomed together at BlogHer Food last June and had a blast though. I can’t wait to visit her once her little guy arrives. 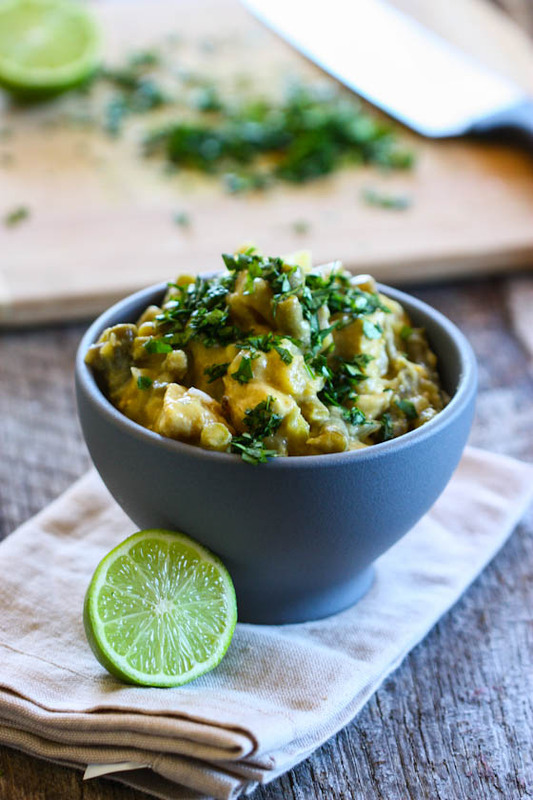 Her blog features all these yummy gluten-free recipes and entertaining tips — trust me, you want to check it out, even if you love gluten like me. I decided to make these delectable salted caramel chocolate cookie bars for the party! No, they are not gluten-free but yes, they are probably one of the most delicious things you will ever put in your mouth. 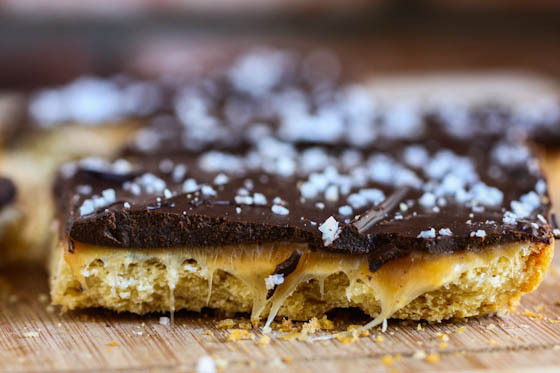 Think a buttery shortbread crust topped with chewy caramel, dark chocolate and flaky sea salt. It was a major struggle not to eat the entire pan myself! I got the idea to make these after a rather aggression Twix craving. I haven’t had Twix in years, but suddenly I NEEDED one. Well, naturally I started baking what I thought would taste just like a homemade Twix bar but instead it sort of became its own thing, which ended up being better than any Twix I’ve ever had! If you’ve been reading my blog for awhile, you know that I’m a huge salted chocolate fan. Okay fine — I’m actually just a huge salt fan! 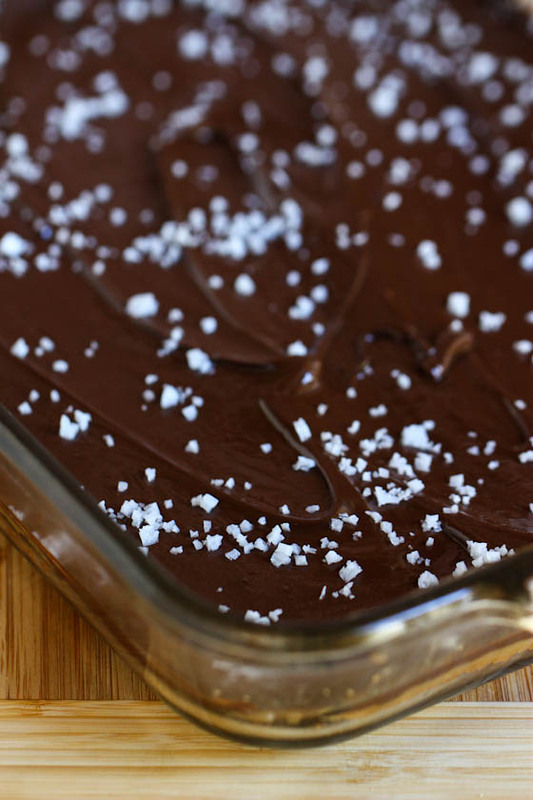 I love big, flaky, crunchy sea salt….and sweet/salty dessert creations are my favorite! Here’s my favorite kind of sea salt; I highly recommend it for all your sweet and salty treats. Spray a 15 x 10″ glass baking dish with cooking spray and set aside. Cream together the soft butter with the granulated sugar and powdered sugar until fluffy. Then, add the vanilla and salt. Mix in the flour until you have a soft dough then press dough into the bottom of the baking dish. Prick holes all over the dough using a fork then bake for 35 minutes, until golden brown. After baking, remove crust and let cool while you make the caramel layer. Melt together the chopped caramels with the cream in a medium saucepan over low heat, stirring constantly. Once melted completely, pour caramel over cookie crust, smoothing with a rubber spatula. Set aside. Melt the chocolate chips with the butter over low heat, stirring constantly. Pour the chocolate over the caramel layer, smooth with a spatula, then immediately scatter flaky sea salt all over the top. Set in the fridge for an hour to cool completely before slicing. To slice cookie bars, run a knife around the edge of the pan to loosen then gently take the entire large “cookie bar” out of the pan and place on the counter. Using a HOT knife (keep the knife in a mug of hot water), cut into bars. The hot knife is key here — be sure to wipe knife with a paper towel between slices. Be sure to check out what everyone else made for the party! I really wish it was more than just virtual because I want a plate of everything! These bloggers really know how to throw a party—YUM! Congrats to Lisa and her family! What a cute idea, too! I’m kind of loving the Fleur de Sel caramel syrup from Trader Joe’s right now. This is so being made! You had me at “Twix”! My hubs is a twix fanatic and claims it’s all about the cookie. Can’t wait to try these! These look crazy good! How do you get inspiration for recipes? What a cool idea for a baby shower! These bars look amazing… better get the stretchy pants out! These look insane but a little too complicated for me. 🙂 I think you should just package these up and start selling them. I’m sold! Love everything about this virtual party idea (except, of course, that you can’t eat all the delicious treats). But what a feast for the eyes and a great way to connect. These look soooo good! I need some of that flaky salt, I can never find just the right one for these recipes! My mom makes a version of these bars at Christmas, but without the salt. They are mega delicious! Must try this version some time too! Congrats to Lisa! These bars sound and look amazing! My mom makes a version with an oatmeal “crust” that’s topped with chocolate and peanut butter. I have this bookmarked for thanksgiving. YUM! Those look absolutely delicious! I need to find an excuse to make them immediately! Whoever came up with the idea to combine chocolate and caramel into one dessert is a genius! These look like they’d be a great post long run treat! oh my they look good! I love all things chocolate and caramel! After seeing the pic of these, I was surprised to see how simple they are! They look incredible and I’d love to try them. I’m going to be a little late for the shower. I need these RIGHT NOW. Wow. Those look really decadent! We just all link up (like you see at the bottom of the post) with all of our goodies — it’s just good “new fashioned” party fun! 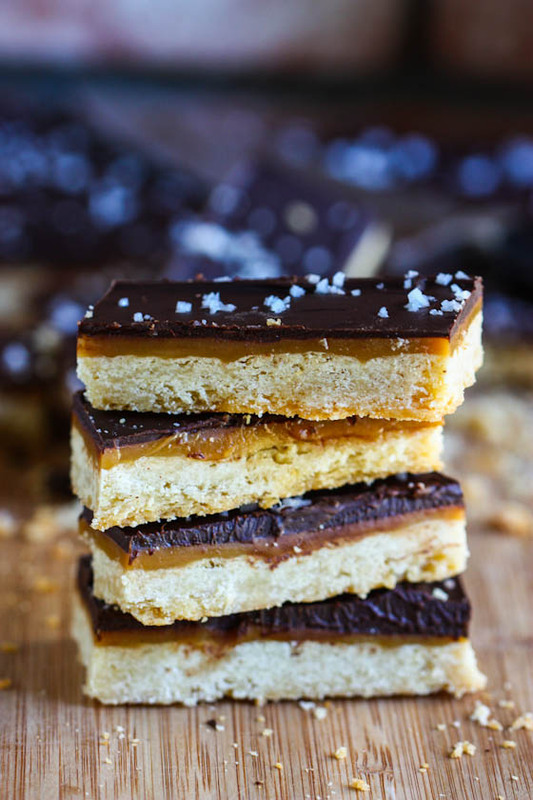 I’ve been dying to make something like this… I’ve been craving the caramel cookie bars from Little Debbie forever, but I do not want to buy the pre-wrapped caramels… do you have a recipe for caramel that would set up like these do that I could substitute??? these look so good an decadent! the trader joe’s fleur de sel caramels are pretty fantastic. Wow. Looks like something I’ll have to contemplate. What a cute idea for a shower! I’m a huge candy fan so having a homemade one is the best idea EVER! These look to die for! I’m a huge fan of the sweet/salty combo and can’t wait to try making these. Congrats to your friend on the baby! I am making these ASAP. I my stomach growls in anticipation. You should get a Nobel Peace Prize for this recipe. They give them out for the culinary arts now, no? If not, they should! These look great! And thanks for the Trader Joe Caramel notice … I bought a container yesterday and ate like 5 of them within a few hours. They are dangerousssss, but oh so good. And now I’m craving Twix too, or rather, these homemade delights. I’ve been following your book tour updates and I’m bummed you aren’t coming to Salt Lake City. Would love to meet you! You have such a way with food! Those look incredible, I wish I could make my desserts look as pretty as yours!! I’m so happy for Lisa. I love this recipe – they are the best. Perfect for a shower. 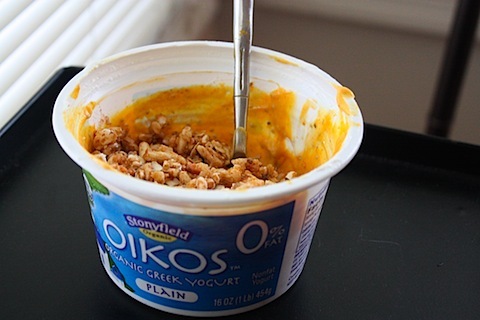 I made something similar just with corn flakes, and I love salt and caramel combo oh so much! Fat jeans on. I’m ready to go. Congrats Lisa! Twix was a great idea. Love it! Oh man. These are just unfair. How can you post these on a day when I have no time to bake?? Mean. On the other hand, they will definitely make the weekend something to look forward to! Yum! 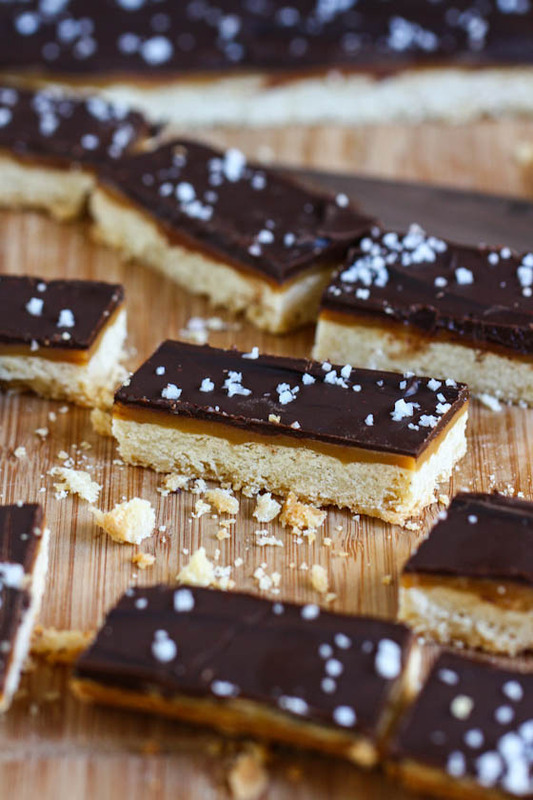 These are my kind of bars — I love Twix and anything with salted caramel! Ohh my – these look incrediiiible. Mmm… these look amazing, Jenna! Thank you so much for the kind words and making this delicious dessert! I wish we were still in California so we could continue with our lunch dates & so you could meet this little guy. I have a feeling you’ll meet him soon enough though 🙂 I’m very thankful to call you a friend – thank you love for everything! I love the sweet and salty too! And as soon as I saw the first picture I was wondering if they tasted like kit-kats. Even better than kit-kats sound great in my book! So yum so yum!!!! I cannot wait to give these a try! I love that everyone has such a connection to Lisa… her love for life is electric. Gorgeous dessert for the shower! Those look WAY better than any Twix bars I’ve had before! I love it. They look totally fantastic and super easy to make. And isn’t Lisa the best? So sad she moved away from San Francisco! These look sooo good! Twix bars are amazing. Mmmmm, salty twix bars? Sold! Thanks so much for this delicious recipe! ummm… i think i found my new favorite thing on earth! Oh my God, I need these in my life. 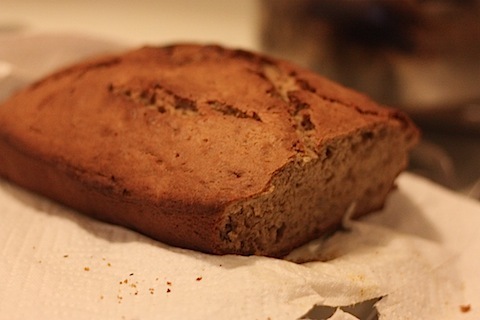 Should be easy enough for me to convert to gluten-free… can’t wait to make them! Wow. If these aren’t delicious, I don’t know what is!